A French door is a door that contains multiple glass panels set into the door, typically extending the length of the door. They are desired for their visual beauty and their ability to pass light between spaces even when closed. 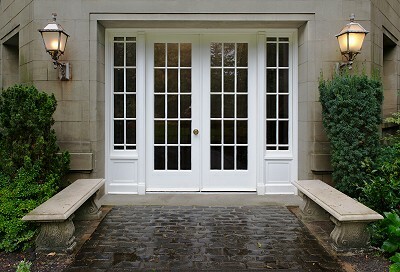 Traditional French doors are assembled from individual small pieces of glass placed in a wood or stone frame. Often external French doors are made of double-pane glass for insulation reasons. Many of the double paned doors have decorative grille embedded in-between the panes. Decorative grille may also be mounted on top of single pane of glass in the door. Some custom French doors use stained glass panes, if you have an interest in building a custom French door, feel free to contact us, to find out more.